Although it would have been easy to create a smooth surface, the hammered marks on this bowl have been emphasised deliberately. They exclaim 'handmade', the essence of the Arts and Crafts ethos. Arthur Dixon ran evening classes specialising in beaten metalwork and was the chief designer for the Birmingham Guild of Handicraft. The Guild produced high quality, handmade pieces and took into consideration the welfare of the craftsmen. Alongside metalwork, they also produced furniture, books and a magazine called The Quest. Raised copper bowl with hammer marks, with cast brass handles.Brass decoration riveted on to body of bowl. 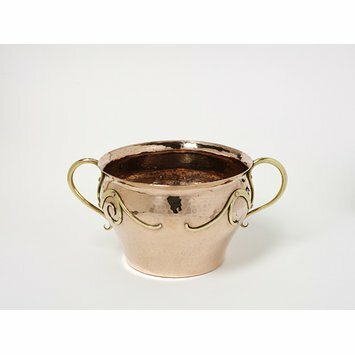 Copper and brass, Birmingham ca.1895-1900, designed by Arthur Dixon.